The New Horizons is the spacecraft that NASA sent to discover Pluto and its moons. As Hubble Space Telescope discovered a new moon that orbits Pluto. So NASA Launched the spacecraft that will reach there in the year 2015. That such a complex collection of satellites is orbiting such a small planet – it’s roughly 1,433 mile (2,306 km) diameter is around 66 percent that of the Moon – has intrigued the team, who say this latest discovery provides additional clues as to how the Pluto system formed and evolved. The smart money is on the theory that Pluto’s moons are the result of a collision between the dwarf planet and another large Kuiper Belt object billions of years ago. 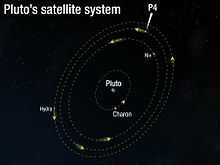 Following the discovery of Charon, Pluto’s largest moon, in 1978 in observations made at the United States Naval Observatory in Washington, D.C., Hubble uncovered two additional small moons, Nix and Hydra, in 2006, and another, P4, in 2011. This could pose problems for the New Horizon spacecraft, which will be moving past Pluto at a speed of 30,000 mph (48,280 km/h) and could be destroyed in a collision with orbital debris the size of a ball bearing.